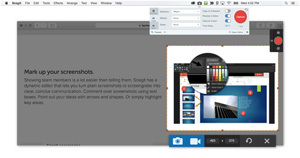 Techsmith has unveiled the latest edition of its screen capture and image editing software, Snagit 2018, with updates designed to help users modify specific elements of images. "This is the most powerful version of Snagit we've ever created," said Wendy Hamilton, CEO of TechSmith, in a prepared statement. "Snagit 2018 allows you to quickly and easily create compelling, easy-to-understand visual content that clearly demonstrates processes, how-tos and other information so that everyone can get more done in less time." Users with previous versions of Snagit can upgrade to Snagit 2018 for $24.99. Snagit 2018 is available to new users for $49.99. For more information, visit the Techsmith site.